Meetings of Africa Forum 2018 kicked off on Saturday morning in the Red Sea resort of Sharm el-Sheikh under the auspices of President Abdel Fatah El-Sisi and the participation of a number of African leaders from COMESA countries. Around 41 Prime Ministers from the COMESA group are expected to attend the forum, which will see discussions on infrastructure, entrepreneurship, investment, and women-related issues across the African continent. Several sessions will be held on the first day of the forum under the theme "Entrepreneurs Day", including one on strengthening regional economic systems in Africa which will tackle means of consolidating cross-border cooperation and opening up new markets for African economic blocs. More than 3,000 African entrepreneurs are participating in the investment forum, with El-Sisi expected to attend a session focused on young entrepreneurs. 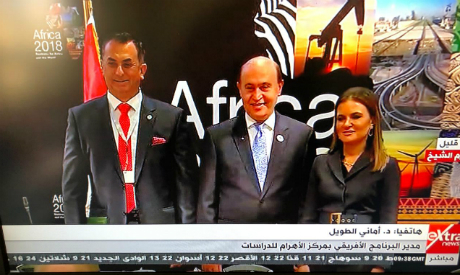 Another session is to be held on policies of African countries in light of developments being witnessed in the entrepreneurship domain in Africa, with the participation of Minister of Investment and International Cooperation Sahar Nasr and Finance Minister Mohamed Maait. A session on increasing the volume of the economic growth is set to be held on Saturday. A number of sessions on empowering the African woman will be also held as part of the forum, including a roundtable discussion on the importance of gender equality in achieving Africa's progress. Another session is set to discuss the role of women in outlining policies of the African continent with the participation of Immigration Minister Nabila Makram, Environment Minister Yasmeen Fouad, Mali's Foreign Minister Kamissa Camara and COMESA Secretary General Chileshe Kapwepwe. A number of agreements will be signed on the sidelines of the first day of the forum.